The Nintendo Wii is getting a new bundle at a newly slashed price, along with a lineup of budget-priced games. After rumors had been hinting at a new Wii price cut for weeks, Nintendo just made it official, but with an interesting twist. On May 15, the price of the Wii will be reduced $50 to $149.99, which is the second official price cut in the console's 4+ year history. I just hope you don't care about Wii Sports anymore. The original Wii pack-in that captivated gamers young and old for years is being taken out of the bundle in favor of Mario Kart Wii (with Wii wheel). 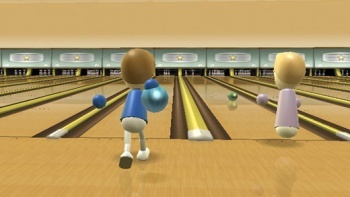 Previously, the Wii was packed with both Wii Sports and Wii Sports Resort. The new Wii bundle will still come in white or black and include the Wii Remote Plus that features built-in Wii MotionPlus technology. However, Nintendo isn't just sending Wii Sports into the endless nether. It'll be part of an also newly announced "Nintendo Selects" budget line, featuring Nintendo titles at the low, low price of $19.99. In addition to Wii Sports, Nintendo Selects will include Legend of Zelda: Twilight Princess, Animal Crossing: City Folk, and Mario Super Sluggers. Mario Kart Wii is a great pack-in, but seriously, taking Wii Sports out to charge $20 for it? That's an odd move. If it was Wii Sports Resort, the majorly upgraded version of Wii Sports that features much more content, it'd be understandable. As such an integral piece of the Wii's success, why not just leave it in the bundle? The price cut is likely a move to reinvigorate Wii sales before the announcement of Nintendo's next console to be made at E3 2011 in early June. Dubbed anything from Project Cafe to the Nintendo Feel, rumors have it blowing the Wii out of the water in tech specs and innovative ability. It'll be interesting to see what kind of pack-in, if anything, Nintendo comes up with for the new machine.